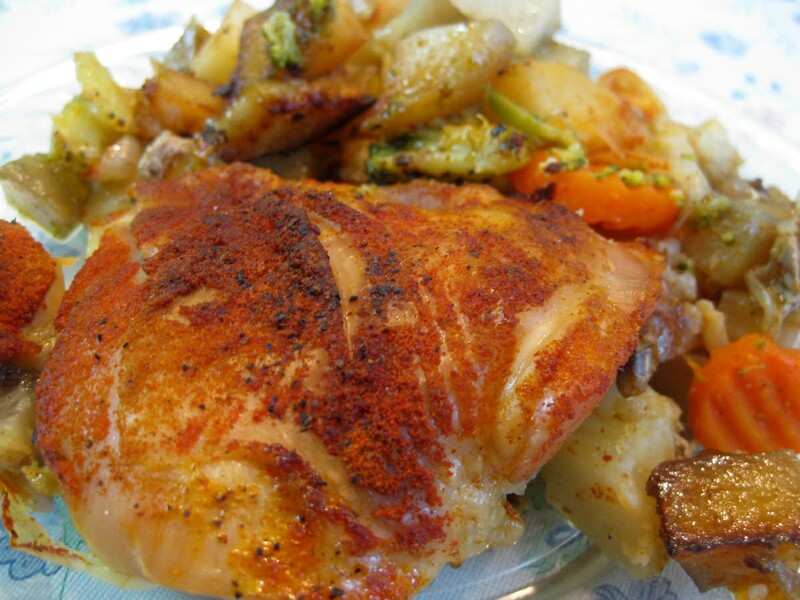 Here is another simple recipe for a baked chicken (the other one is chicken on salt). This is one of those quick and easy 10 minute dinner recipes you can get going in no time at all. No excuses for not having time to cook! Preheat your oven to 375F. Peel and cube two or three potatoes. Also peel an onion and slice it into circles. Grease the bottom of a baking pan with oil. Add potatoes and onion. Also add some frozen vegetables. Place the chicken on top of all this. Season with paprika, salt and pepper. This is one of those recipes where the exact ingredients don’t matter so feel free to experiment with whatever you have in your fridge. 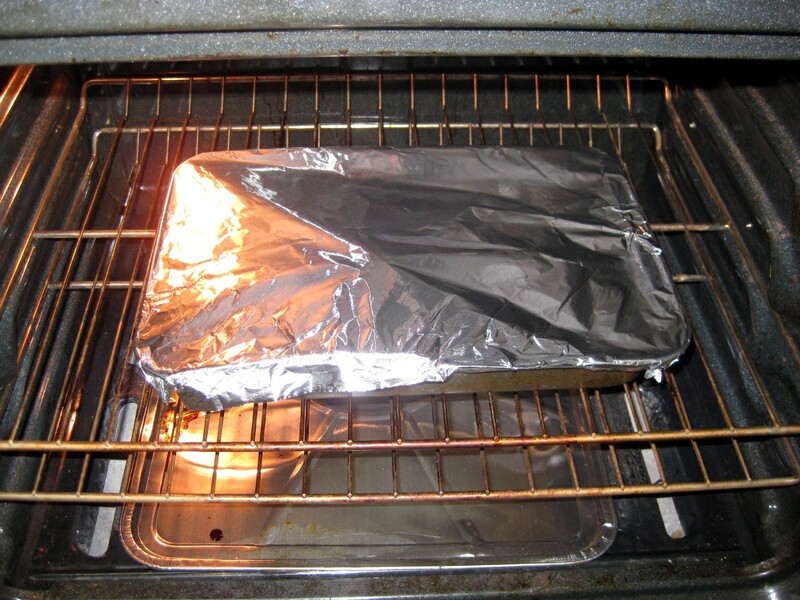 Wrap the baking pan in aluminum foil and place in the oven for about an hour. Check the chicken few times close to the end to make sure it doesn’t get burned. 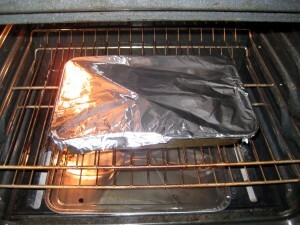 Be careful when unwrapping the foil as there will hot steam escaping from the inside. Then when everything looks almost done, unwrap and lift off the foil from one end. Bake like that for additional 20 minutes. This will brown the potatoes and the skin. 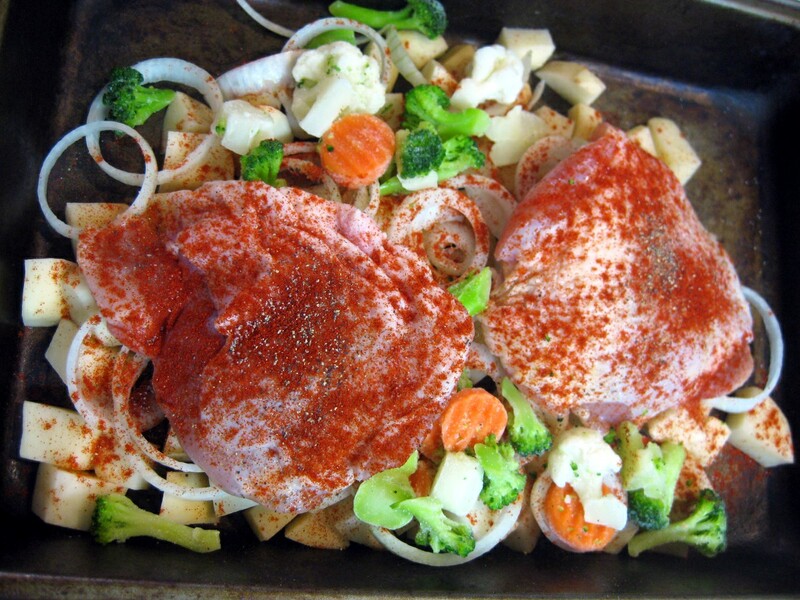 For a totally different chicken recipe, check out chicken paprikash. Great site. You did not mention at what temp to bake the chicken. Never mind. I just reread the receipe again and this time I saw the tempeture. Thanks again and great site. No problem. By the way, I wouldn’t bet my life on that temperature. I baked this chicken about 2 weeks ago. I meant to post the recipe right away so I didn’t write down the exact steps – I figured I’ll still remember them. Well, things came up, and updating the website got pushed to the back burner. But I do most of my baking between 375F and 400F. Anything higher, and the super sensitive smoke alarm in the house comes on (I seriously can’t stand fire alarms, especially ones that don’t have any sort of a shut off switch and are located right next to the kitchen). it depends on what you bake. 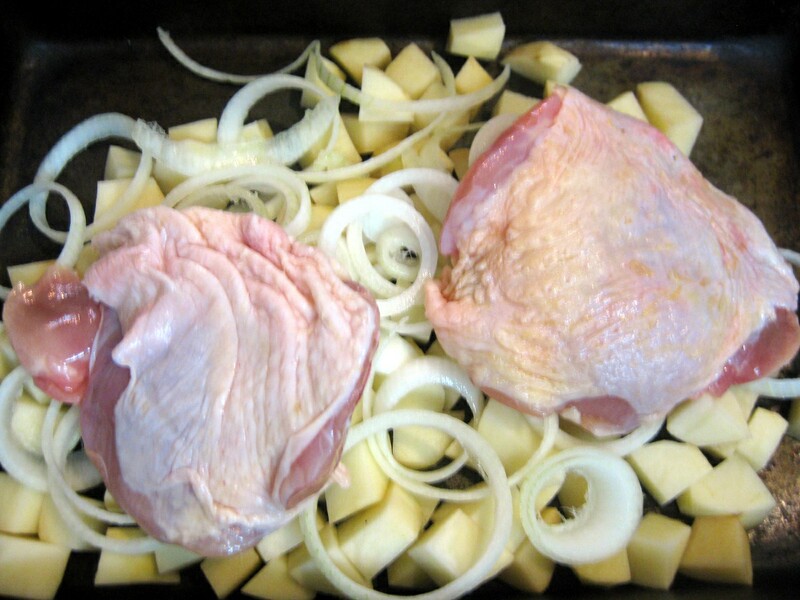 375F – 400F is good for chicken, you need less for pork or lamb 350F would do. Beef is ticky as it depends on what kind of beef you bake/roast. It looks just mouthwatering. I can’t wait to make it. I made this for dinner last night and it was delicious! The juices at the bottom of the pan (I had about 2 cups) – I strained, spooned off most of that fat and thickened for a sauce. Fantastic! Will absolutely make again! Thank you for sharing! 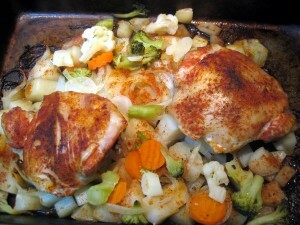 Chicken (Pečené Kura) recipe – Slovak Cooking < Liked it!